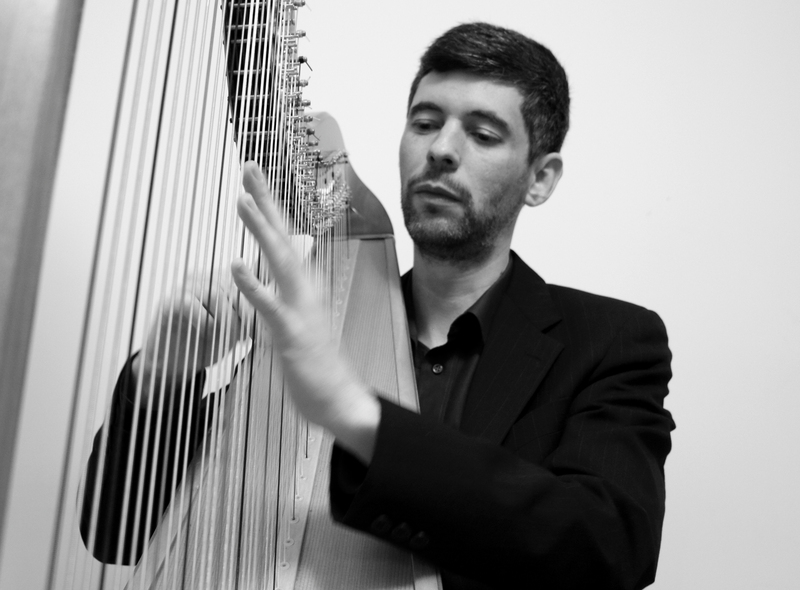 An Interview with Victoria harpist Josh Layne | Oak Bay Music: Chamber Music Concerts Victoria B.C. 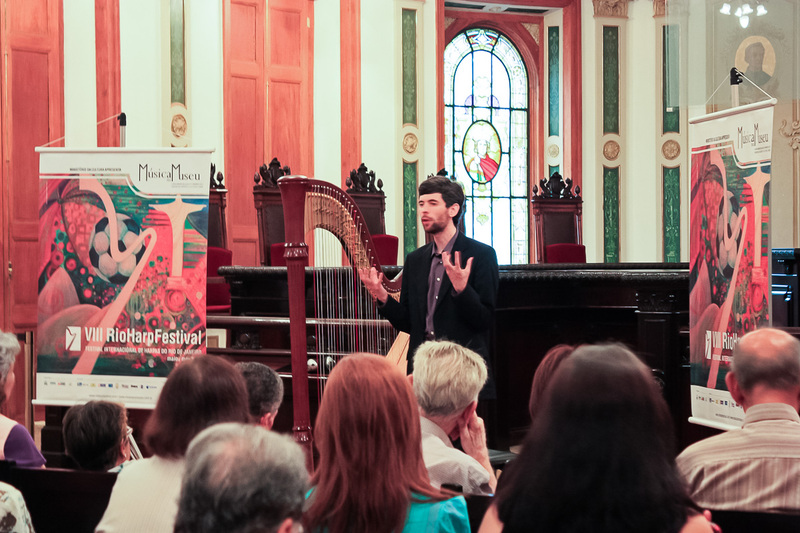 On March 23rd I had the pleasure to interview harpist Josh Layne. Erik: How did you start out on the harp? Josh: I got started when I was thirteen. I was listening to a lot of Celtic music by Philip and Pam Boulding – Magical Strings – from Seattle and there’s a lot of harp in that. I somehow thought the harp would be a cool instrument to learn. I happened to find a wonderful teacher and a second hand harp at a great price, everything sort of fell into place, I loved it, and I went from there. Erik: Did you take private lessons? Josh: Yes, private lessons with Kathryn Ely in Victoria, a fabulous teacher. When I started out, I didn’t have any background in music. We had a piano growing up, but I didn’t know how to read music. For me thirteen was a great age to start because you’re able to process things in a different way than when you start at six or seven. I never felt that it held me back, starting at a relatively late age for classical music. When I started I was interested in Celtic music, but part of the joy of the instrument is the challenge, and the more challenging pieces were classical, and I got gradually drawn into the classical field. So at this point that’s almost all I do. When I was about fifteen I got the pedal harp that I have now. Erik: Where did you get your harp? Josh: From Lyon and Healy in Chicago. I believe they are the largest harp firm in the world. It was a big thing, they are expensive. We bought it, and it got sent out. We went to the airport to pick it up. You hope of course that it is all in one piece and that it sounds good; that was quite an adventure. Erik: When did you decide to turn harp playing into your profession? Josh: Around the time that I got my pedal harp, I started doing some gigs and concerts, in order to pay for it, and I knew at that point harp playing was something that I was going to continue to do, that this was my passion. Erik: So the purchase marked the transition into becoming a professional player. Josh: I don’t know if it was the purchase, or if the desire to play professionally drove the purchase, but yes, it is a good marker that at that point harp playing was something I wanted to do professionally. Erik: I would think an harp is quite expensive. Did your parents support you? Josh: My parent were very supportive. In our family there was always a sense that creating art was something wonderful. And it wasn’t like, oh, this is great, but now go and study law or become a doctor or something. There was always wonderful family support. It was a big investment for us, I can’t exactly remember what it was at the time, but I think that model now would cost $25,000. Erik: Where were your first concert appearances? Josh: When I got the new harp, I played at a lot of retirement homes. This was a great way to get performance experience in a very low stress situation. In a more academic approach, doing exams and festival, there often is a lot of pressure, but here, if I made a mistake, no problem, everybody is there to enjoy the music. So that ended up being a great way to get performance experience. 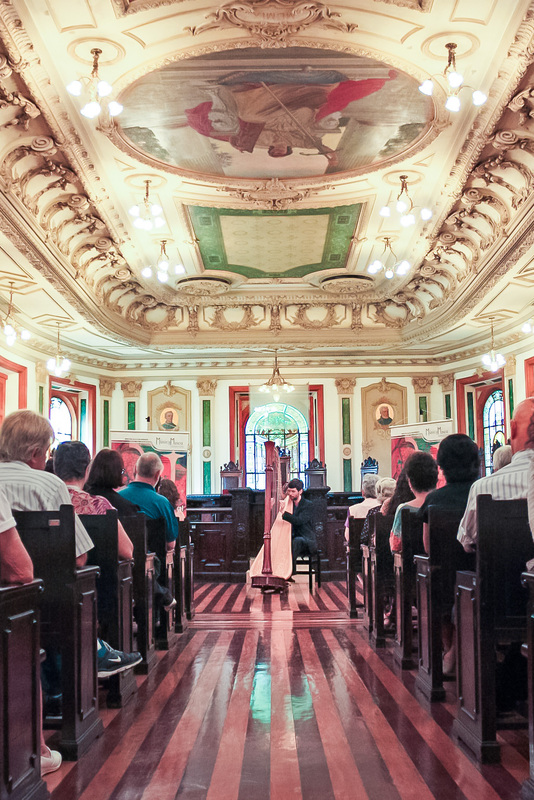 Four years after I started the harp I did my first recital. And from that point on, I would take about a year to prepare a new program. Erik: Over the last few years you’ve also made several CDs. Can you talk a bit about the process that was involved? Josh: My first two CDs came one after the other. They were recital programs that I had worked up. The next one came about three years later. Again, it was a recital program. And then I did not record anything for a long time until a couple of years ago, 2013. 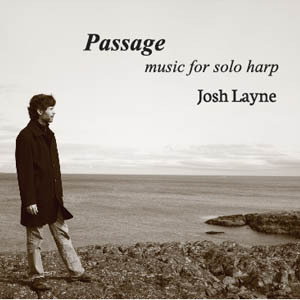 This CD (Passage: music for solo harp) is particularly special because not only does it include some works that I have played for many, many years and had wanted to record for quite some time, but it also includes three of my own original compositions. Erik: You do some transcribing as well, right? Josh: I do some transcribing, absolutely, mainly of piano pieces. Last fall for example I did a piece that I recorded on one of my CDs, the Concierto de Aranjuez, the slow movement, in which I play the guitar part and the orchestral part. On this program I am doing Fur Elise, which is my transcription. Essentially I am playing exactly the piano part, except right at the end there is a very chromatic section which I can’t actually do on the harp, the pedal changes just don’t work. Erik: Do you see that as a challenge, to play piano pieces on the harp, or, how do you decide on what to transcribe for harp? Josh: I am looking for music that speaks to me, that I would enjoy playing, and then trying to find something that does work on the harp. For example, Chopin, I haven’t really found something that works on the harp. It is such pianistic writing, I haven’t found anything that I am happy with, maybe I will in the future. Bach sometimes is a challenge because the lower notes come through quite clearly on the piano, but it gets really muddy on the harp because the strings keep ringing, unless you specifically muffle them. So sometimes I have to move things up an octave to make them work. Many years ago I tried to transcribe the entire Pictures at an Exhibition, because I love that piece of music, of course written for piano originally. I did the whole thing, but in the end I decided that it wasn’t that effective, I wasn’t happy with it. But then, last year, I took it out again, and I ended up working up the opening theme, the Old Castle, and the Great Gate of Kiev. So just those three, and I was really happy with that. Erik: What pieces are on the May program? 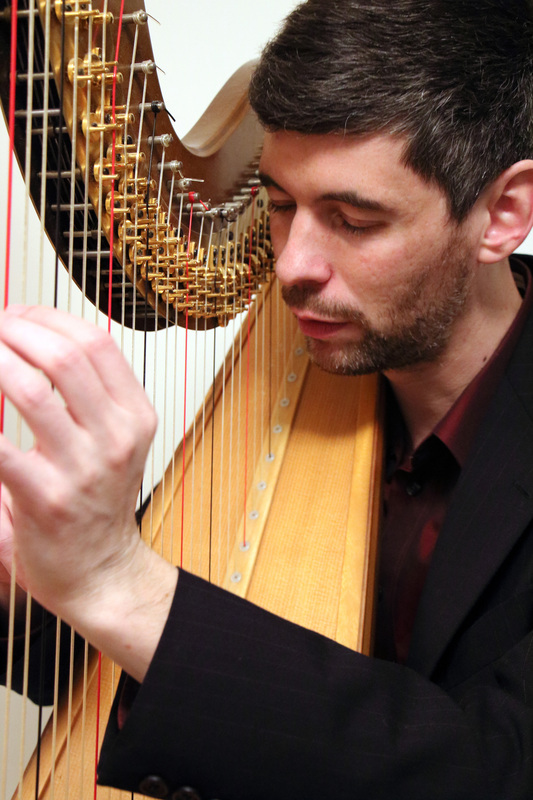 Josh: The Handel harp concerto, one of the oldest classical pieces specifically written for the harp. A fantastic piece of music, and the cadenza is by Grandjany. That cadenza is almost a piece in itself, it is about two and a half minutes, great fun to play. So that’s a big, solid piece. The Grandjany’s Rhapsodie is also wonderful. Grandjany was a French harpist and composer, sort of Debussy and Ravel, but definitely has his own style. His Rhapsodie is a piece that I’ve performed a couple of times over the years, but I feel that there still is a lot of living to do with it, a lot to learn about it still. For the second half we have some shorter pieces. There’s my composition Autumn Labyrinth composed in 2013. As a composer, and a performer, I know that, not only my work will get to be performed, but I also get to live with the piece for some time and see how the piece evolves through playing it. Erik: So, it also makes you a better informed composer? Josh: Exactly. Then there’s the Prokofiev Prelude, which is quite short. He wrote it for harp or piano. It’s a lot of fun, I think it is based on a folk song. It’s not long, not a big-meal piece, but it is quite delightful. There’s also a piece by Sir Granville Bantoc, called Hamabdil, and I am looking forward to that because I get to play it with you, and I am looking forward to how that sounds, especially the combination of the harp and the saxophone. That will be exciting. And then finally Baroque Flamenco by Deborah Henson-Conant, a harpist and composer. She’s a wonderful story teller. The piece has two separate moods, the very dignified Rousseau theme, and then suddenly we’ve got this flamenco variation coming in, with wild rhythms, and it ends up being quite a riot, and a lot of fun to play. Erik: Are you playing this program elsewhere as well, or is this a one off? Josh: I will do this program also in Rio, Brazil. I am performing there on May 8th, 9th, and 11th. Erik: Is this at a conference? 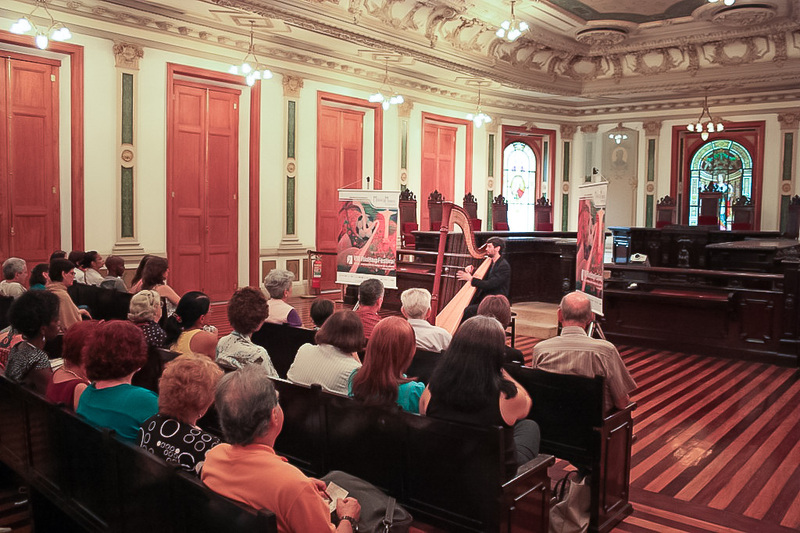 Josh: It’s at a month long festival, and they invite harpist from all around the world. It takes place in these historical sites. This will be my third year down there. Quite a wonderful experience. Erik: Well, thank you for the interview, I’m looking forward to the concert. Josh Layne will perform at the Oak Bay Matinee Concert Series on May 3, at 2:30pm at St. Mary the Virgin, 1701 Elgin Rd.